As the long lazy days of summer drew to a close, Harker sponsored several separately held welcome-back-to-school barbecues at the lower, middle and upper schools. It was all part of a schoolwide effort to help students and their families more successfully transition into a new year. Harker’s Bucknall campus set the scene for two different back-to-school barbecues – one for kindergartners and another for grades 1-5. In late August kindergartners and their families gathered at the lower school to socialize and enjoy delicious food, which was generously donated in part by Brown Chicken Brown Cow, a new restaurant recently opened in Campbell by Harker alumnus Chris Yamashita ’90. 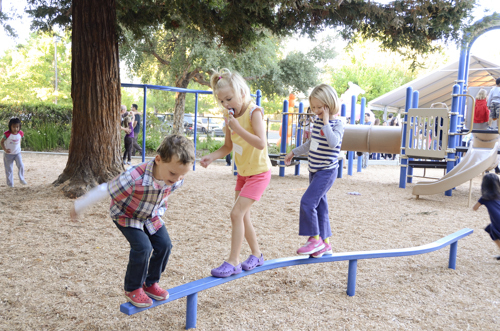 At both happenings, parents took the opportunity to relax and catch their breath during the hectic back-to-school time, casually chatting with one another, as well as with faculty and staff, while their children took to the play yards. Meanwhile, the middle school hosted their second annual barbecue on the Blackford campus in mid-September, with more than 400 attendees. Parents went the extra mile, pitching in by cooking and creating fun activities for the students, including volleyball, tug of war and making candy sushi. “The relaxed event was a great way for new families to meet current Harker families and to bring the community together,” recalled Jennifer Hargreaves, Harker’s director of middle and upper school volunteer programs. Hargreaves further noted that there was also an upper school welcome barbecue evening event for parents (replacing last year’s breakfast for parents) which coincided with the student social First Friday. Both events had a large turnout, with the added bonus of bringing upper school students and parents to the Saratoga campus simultaneously. Over the years, Harker’s volunteer-led back-to-school barbecue events at all three campuses have grown in popularity, with attendance increasing steadily.